When my daughters were preschoolers, they coined the phrase, "company girl," to describe how they kept each other company. It's stuck with me ever since. Hand in hand, they would skip off to the back yard, or to a tea party in the living room, or for a snack in the kitchen. It didn't make any difference where they were, or what they were doing...they knew it would just be better as long as they were together. I learned something valuable from those two darling redheads. I learned that friendship can be so much less complicated than I had imagined. Sometimes, simply being together is enough. Just having a "company girl" friendship makes everything sweeter, richer, and more enjoyable. Recently, I've come to see how friendship is more than just sweet, it is like a secret superpower. Turns out, friendship not only makes life feel good, it reduces stress, and makes us healthier. Friendship boosts our immune system, helps us become more successful, and even helps us live longer. Friendship is one powerful force. Girls, this is great news! We are Wonder Women...and we didn't even know it! I mean, if you could bottle that force and sell it, you'd make a fortune. I can't think of any pill that packs that kind of promise! That's why I call friendship our superpower. Now, some women are naturally good at making and keeping friends. Others of us need help brushing up on our friendship skills that have gotten a little rusty. You'll get no judgment from me here. Because, while we've focused on meeting the demands of work, kids, finding receipts, taking out the trash, and remembering to put the load of washed clothes into the dryer before mold sets in, we've let friendships take a back seat. It's hard to juggle everything, and hey, when your kid needs a model volcano for science class tomorrow, and by sad coincidence, you have no idea what to fix for dinner.....enjoying a cup of coffee with a friend can wait, for pete's sake. But maybe it's time to unleash your hidden superpower. Now is a good moment to put the sparkle back into your girlfriend relationships, and experience the ripples of good that not only go out into the world, but come back to you in remarkable ways. If you would like to rediscover your friendship superpower, I want to invite you to a very special event! On Saturday, February 20, I'll be speaking at the luncheon at the Day for Women in Temple, TX. In the meantime, I challenge you to do something friendshippy–something you've been putting off–like writing a letter, or grabbing that cup of coffee, or making a phone call to a friend. A text or email will do, but maybe you can put your superpower to the test and come up with something amazing! Don't think about yourself and how it will make you feel, but think of the person you're extending a hand to, and how it will make her feel. Remember, a superpower is worthless when it's kept under wraps, so go out and wield it! Be the friend you wish you had...and see what happens next. What will you do that is friendshippy and superpowery? I'd love to hear your comments! In the spirit of friendship, I'll give a free, signed copy of my book Flash to one lucky commenter today! January causes me to be reflective about many things, especially about the ways I use my time and energy. For the past several years I've thought a lot about this blog and about why in the world someone like me would write daily about "mundane" things like laundry, dishes and vacuuming. I mean, I could see a more Martha Stewart-like person (highly organized and extremely creative) taking it on and showing the world how it should be done....but me? I'm the one who naturally puts off all those things in favor of daydreaming and making up stories. Making piles, er "stacks" is my signature organizational style. Hardly something to emulate. And yet, here I am. For the past six of my seven blogging years, I've posted daily Small Things - simple, easy tasks - that revolve around the home. Not because I'm passionate about cleaning, but because I'm passionate about sanctuary: the idea that my home should be a place of refuge and grace for the people I love. I want this place to feel good to come home to. Housekeeping is (unfortunately) a big part of creating that for my family, but really, it's just one piece of the puzzle. I've written about them many times before, and I always seem to come back to this trio because they are so interwoven. When I have some semblance of order at home, there is a sense of peace that comes. Being able to find a matching pair of socks brings an incredible feeling of happiness to me. Seeing a sink, empty of dirty dishes, makes my heart soar. I've found amazing beauty in a coffee table devoid of candy wrappers and soda cans. And making small changes in my attitude has affected my family relationships in a big way. Every single task I do seems to fall into one of these three categories - and I find that just knowing THAT gives me a sense of purpose. I've learned that Small Things matter. I'm passionate about sharing that sanctuary is not just for the Martha Stewarts of this world. Tired women with too much on their plates can make it happen - in small ways every day. You don't need to be able to reupholster a chair before breakfast to be a supermom. You don't have to create an amazing centerpiece out of fresh greenery you've cut from your backyard and then photograph it beautifully in order to be a successful homemaker. It really is OK to clutch your cup of coffee like a life raft in the morning and shuffle around until you are conscious. It's OK that the laundry is piled up and that your kids are having cold cereal for dinner again. Really, making a sanctuary is about so much more than that. Sanctuary is about loving one another inside these four walls. Sometimes loving someone means sorting socks for them. Sometimes it means planning a menu or setting up a housekeeping schedule so you can focus on other things. Sometimes it means locking the door and taking a long bubble bath without anyone bothering you. Sometimes is means that you rearrange a bookshelf or empty the dishwasher - tasks that are housekeeping in nature but are in fact, ways of loving yourself and your family. And when you see these mundane tasks for what they really are, suddenly you see sanctuary happening all around you. Today's Small Thing is to commit yourself to creating a home sanctuary. You are not committing to being a superwoman - we know we can't keep that up for more than a week, tops. What you ARE committing to is a deliberate choice to find beauty in each day, no matter how difficult your circumstances. It's there, and God will help you find it - I know he will. Commit to doing ONE thing - a Small Thing from here at Home Sanctuary or something of your own choosing - that brings a touch of peace, order or beauty into your home. I'm here to help you do that each day. What we do here isn't hard. It's not rocket science. It's not revolutionary. Small steps have the power to create sanctuary. They have the power to change your life because big things happen in small, daily efforts. God takes the tiniest bit that we have and adds to it in a mighty way. If you have just a shred of faith and hope that he can make something good happen, then stay along with me this year, 2014. We'll do our little part....and then leave the rest to him. Watch a miracle take place in your home - one Small Thing at a time. I hope you'll subscribe to the daily blog feed via email or blog reader (link is at the top right corner of my blog) so you won't miss a thing. And then subscribe to my newsletter, which comes out only occasionally. These are easy ways to stay connected with me and the rest of the Company Girls as we create home sanctuaries together. What is one thing you can do today to bring a bit of peace, order or beauty into your home? Oh, how I love Autumn! It's not just because my daughters have beautiful "Autumn" complexions and hair. This photo is from a couple of Autumns ago. It's one of my favorites. I love Fall mostly because the crisp air makes me feel invigorated. I did a cartwheel the other morning, just just because I was THINKING about fall weather. I can't wait to put pumpkins and mums out, even though I know it will be awhile before that crisp air gets here! The Breezeway gets to be more like a wind tunnel sometimes, and it's hard to keep it looking nice. Plus we've had an invasion of spider webs that are icky, so very icky. Today's Small Thing is to simply sweep your front porch, stoop or walkway. I'm completely aware that it's a losing battle, but we've gotta fight on until winter, girls! Away with you, crumbly leaves! Be gone! Death to spiders! This is a pretty easy job. So easy, you could get one of your children to learn some responsibility and do it for you! :) Sometimes easy jobs are just enough to raise your spirits and make you turn cartwheels! Song of the Day: Autumn Leaves, Nat King Cole of course! pop in on some of the other blogs to say hello! It's easy and fun...and opens a whole new world of friendship. Are you looking for some last-minute gifts to give to the special girlfriends in your life? I have just the thing. I happen to have 35 signed copies in my studio RIGHT NOW that I will ship out, first come first served, right away.....just in time for Christmas. But you'll need to order by emailing me asap to get yours. Now, you can always order the books from Amazon or at my little bookstore, but just know that those copies will not be signed. If you do order online that way, you should still get them before Christmas - even though the shipping info may say otherwise. Orders generally take 7-8 days to receive. So, ladies! Send me an email, letting me know how many copies you would like. The cost is $12.95 each, plus $3.00 each for shipping. If you need to order a whole bunch of them, we can work out a better shipping fee for a bulk sale. When my 35 signed copies are gone, all orders will have to go through the store. I'll give you payment option info when you email. P.S. Want to know more about the book? Find out here. Hey there, Girls! I want to invite you to join Priscilla Shirer's live webcast today at 10 am CST....in which I will be one of her guests! Priscilla has been hosting a book club for her newest book, The Resolution for Women, and this week's topic is "Loving My Children." I am so honored to be part of the round table discussion with Priscilla and her sister, Chrystal (another incredible mom) and know it is going to be a fun - maybe challenging - hour. Hop on over and join us for all or part of it! I believe you'll be able to log in and "chat" while we talk...and you can pose your own questions about parenting and loving your children for us to discuss. I have FOUR active toothbrushes. Is that excessive? I don't know. All I know is that I love the just-brushed feeling that a stick of gum just can't give you after you've eaten garlic and onions. But as much as I love my toothbrushes, I hate to clean the toothbrush holders. Maybe because I'm a "neat" brusher and don't have foam running down the handle when I brush, while others in this household jam their wet, drooly handles into the receptacles without so much as a thought. All that crusty toothpaste that collects at the bottom doesn't belong to me so I don't want to be responsible for it. Is it me, or is that crust just nasty??? Blech! 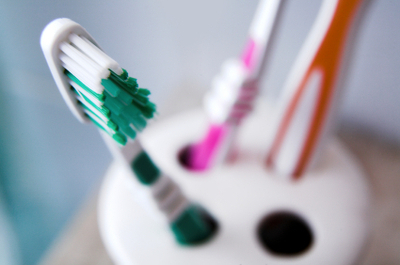 Today's Small Thing is to clean your toothbrush holders (or wherever you store toothbrushes.) You might need to let the years of saliva sediment soak in warm water for awhile before you can face scrubbing them. It will feel great to see those holders looking all shiny and pretty again! More confessions: when was the last time you replaced your toothbrush? ...feel like I've had a brush with celebrity. Today, I'm a guest blogger on Hannah Keeley's website! Remember, she is doing a special promotion with American Standard Heating and Air Conditioning, and has invited several guests to help promote it. I'd LOVE to have a huge Company Girl participation so people sit up and say, "who ARE those girls???" Aww, just the Company Girls, yeah. Company Girl NATION, that's who. Could you use a new $15,000 heating and air conditioning system? We could. Our upstairs unit has been on its last legs for the past decade. The last time we had someone out to repair it, the guy laughed and adjusted his hat before saying, "Ma'am, they stopped making those units in the 1980's." Just fix it, buddy, I don't need your commentary. All you have to do is fill out the form for a chance to win. You might even win a 1/2 day home makeover with Hannah herself...and I think that in itself would be super cool. I love her blog, her tips and her faith and am so glad to have found her website. I know you'll enjoy it, too. If you stop over, would you leave a comment so she knows how you happened by?? If you tweet, feel free to do that, too. Thanks, ladies! Is Anyone Going to Deeper Still - OK City? Hey my sweet Company Girls! I'm going to be attending the Deeper Still Conference in Oklahoma City this weekend! I'd LOVE to meet up with you if you are going!! I'll be catching the "behind the scenes" action with my dear darling friend, Priscilla Shirer, and I hear that I might get to chat with Miss KAY ARTHUR and BETH MOORE as well! For Priscilla's blog, of course. I'll be working real hard on that. Actually, PRISCILLA will be chatting with those ladies, and I will be holding the flip camera. So essentially, I will be in the same room with Greatness. I will keep ya'll up to date with the excitement of the weekend....so stay tuned. Let me know if you are going to be there and we will try to figure out a way to MEET IN REAL LIFE! Please tell me it's not Friday already! After last weekend's women's retreat, this week somehow blew past. I'm so excited because we are getting a brand new bed today! Girls, you know your bed is BAD when you value SLEEP over sleeping TOGETHER....my husband has had to sleep in the guest room for his back's sake for several months. Which is weird. Kissing each other good night in the hallway and then shuffling off to separate rooms is just...sad. Tonight, the lonely Old People will be reunited once again. In comfort. I am beside myself with joy! I think I'll wear my pajamas all day so I'm ready when the delivery truck arrives. Link up for a virtual cup of coffee below! It's a fun and easy way to make some new friends by inviting people over to your blog to visit. Simply fill out the little form with your blog post URL and that's IT! Voila! Then try and hit as many blogs as you can over the weekend. Don't forget to read the comments because that's where our non-blogging Company Girls chat! There is no Small Thing today, due to my lack of planning around a very late hockey game last night and a full day starting early today. Sorry about that, girls! Please be sure and stop by on Monday for a very cool announcement! In fact, now would be a great time to click on that little "RSS" link in the right sidebar so you can subscribe to my blog posts every day! That way you'll never miss a Small Thing OR my announcement on Monday! Yay!